The direction and magnitude of force produced by the quadriceps muscle has great influence on patellofemoral joint biomechanics. The line of force exerted by the quadriceps is lateral to the joint line mainly due to large cross-sectional area and force potential of the vastus lateralis. Since there exists an association between patellofemoral pathology and excessive lateral tracking of the patella, assessing the overall lateral line of pull of the quadriceps relative to the patella is a meaningful clinical measure. Such a measure is referred to as the Quadriceps angle or Q angle. It was initially described by Brattstrom. The Q angle can be measured in laying or standing. Standing is usually more suitable, due to the normal weight-bearing forces being applied to the knee joint as occurs during daily activity. Traditionally, the Q angle has been measured with the knee at or near full extension (but not hyperextension) with subjects in supine and quadriceps relaxed because lateral forces on the patella may be more of a problem in these circumstances. With the knee flexed, the patella is set within the intercondylar notch, and even a very large lateral force on the patella is unlikely to result in dislocation. Furthermore, the Q angle will reduce with knee flexion as the tibia rotates medially in relation to the femur. This is regarded as the 'traditional' or 'conventional' method. The Q angle has also been assessed on standing. 13.5 ± 4.5° is considered as normal Q angle for healthy subjects between the ages of 18 and 35 years. The Q angle for women is 4.6° greater than that for men due to the presence of a wider pelvis, increased femoral anteversion, and a relative knee valgus angle. Position: Patient supine with knee extended. The therapist stands next to patient. Application: When measuring ensure that the lower extremity is at a right angle to the line joining each ASIS. The foot should be placed in a neutral position relative to supination and pronation with the hip in neutral position relative to medial and lateral rotation. Draw a line from ASIS to the midpoint of patella and then from the midpoint of the patella to the tibial tubercle. The resultant angle formed by the crossing of these two lines is called the Q angle. Positive sign: Normal Q angle score for females is between 13-18° with values greater than and lesser considered abnormal and may indicate the patient is at risk of developing chondramalacia patella, patella alta or mal tracking of the patella. Problem with using the Q angle as a measure of the lateral pull on the patella is that the line between the ASIS and the midpatella is only an estimate of the line of pull of the quadriceps and does not necessarily reflect the actual line of pull in the patient being examined. If a substantial imbalance exists between the vastus medialis and vastus lateralis muscles in a patient, the Q angle may lead to an incorrect estimate of the lateral force on the patella because the actual pull of the quadriceps muscle is no longer along the estimated line. Furthermore, a patella that sits in an abnormal lateral position in the femoral sulcus because of imbalanced forces will yield a smaller Q angle because the patella lies more in line with the ASIS and tibial tuberosity. An understanding of the normal anatomical and biomechanical features of the patellofemoral joint is essential to any evaluation of knee function. The Q angle formed by the vector for the combined pull of the quadriceps femoris muscle and the patellar tendon, is important because of the lateral pull it exerts on the patella. 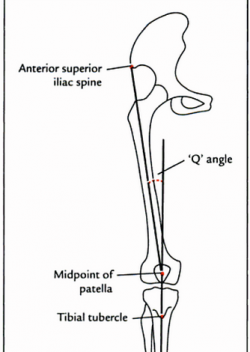 Any alteration in alignment that increases the Q angle is thought to increase the lateral force on the patella. This can be harmful because an increase in this lateral force may increase the compression of the lateral patella on the lateral lip of the femoral sulcus. In the presence of a large enough lateral force, the patella may actually sublux or dislocate over the femoral sulcus when the quadriceps muscle is activated on an extended knee. ↑ 2.0 2.1 Levangie, P.K. and Norkin, C.C. (2005). Joint structure and function: A comprehensive analysis (4th ed.). Philadelphia: The F.A. Davis Company.